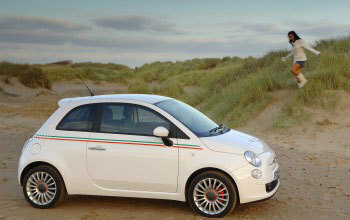 The Fiat 500 is again enjoying winning ways after scooping yet another top industry honour. The multi award-winning 500, which was launched by Fiat earlier this year, has just taken the Supermini and City Car category in the evecars.com Car of the Year Awards 2008. The honour adds to the 500’s already impressive trophy haul which includes Car of the Year 2008, CAR Magazine Car of the Year, Fifth Gear SmallCar of the Year and Auto Express Best City Car 2008. Andrew Humberstone, managing director, Fiat Group Automobiles UK adds: “We are delighted with this latest award which makes an exciting addition to 500’s already impressive honours list. With a starting price of just £8,100, the 500 represents outstanding value for money and positions the car well below its benchmark rivals. At the top end of the range, a highly specified version with a larger engine costs only £10,900 – a price that includes air conditioning and alloy wheels as standard.